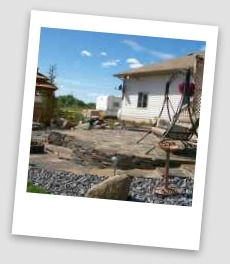 Welcome to Dream Yard's module on building a dry-laid flagstone patio. This how-to will take do-it-yourselfers from start to finish, so you can complete your project like a professional. Flagstone patios have a character and charm that are the envy of the neighborhood. I'm sure that most of us have seen or walked across one and dreamed of having one in our own yard someday. So, is this now your someday? Are you starting to build your dream yard? 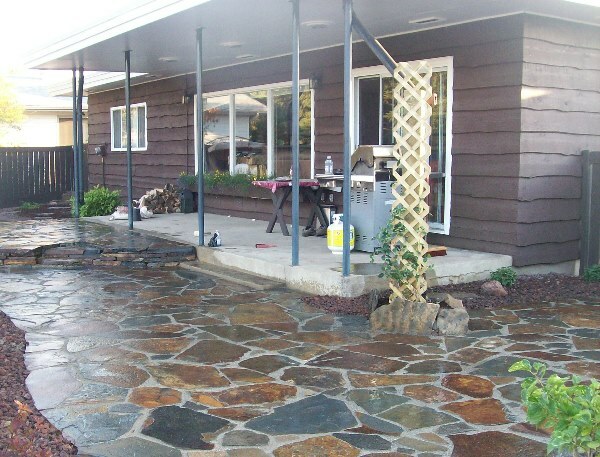 I have built many flagstone patios, and I just love the look on a customers face when they are completed. It's rewarding to be in a business where you can bring dreams to life. The job satisfaction and pride puts a smile on my face as well. We want to be able to pass on the skills, knowledge and experience to give you the confidence to build your own dream yard. As with most stone projects you don't need a lot of fancy or expensive equipment to do the job. You will need time, patience, some basic tools (the rest you can rent), some old clothes you don't mind getting dirty, and a willingness to learn. This how-to is designed for do-it-yourselfers to be easy to read and follow with diagrams, pictures, and videos when possible. This will allow you to complete your project without having to buy a small library of books on the subject. It can also save you hundreds, or even thousands of dollars in the process. Having this helpful information available on the World Wide Web also means we need to point out a few things first. Landscape construction varies in different regions of the world based on the climate you live in, the availability, and cost of materials. We do our best to point out these difference when we can. We also have climate graphs from all over the world to help you when it comes to preparing your sub base. We give as many tips and different techniques as we can to guide you on how to select proper materials, and ask the right questions with suppliers. 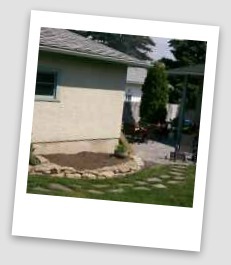 We want you to have a flagstone patio that looks professional, and lasts for many many years. If you are looking for some inspiration and some patio ideas, please visit our patio landscaping ideas photo gallery. We have broken this down into different sections with an explanation for each one so lets get started. Remember to take lots of pictures of before, during, and after. We would be happy to post them in our ideas section for others to see. Now, let's go choose your patio site.